Matubo SuperDuo beads are two hole Czech glass beads that have an elongated shape. They are approximately 2.5mm wide by 5 mm long. Preciosa Twin beads are also two-hole Czech glass beads that have an elongated shape. They are approximately 2.5 mm wide by 5 mm long. Therefore, at first glance, Super Duo beads and Twin beads can look very much alike. 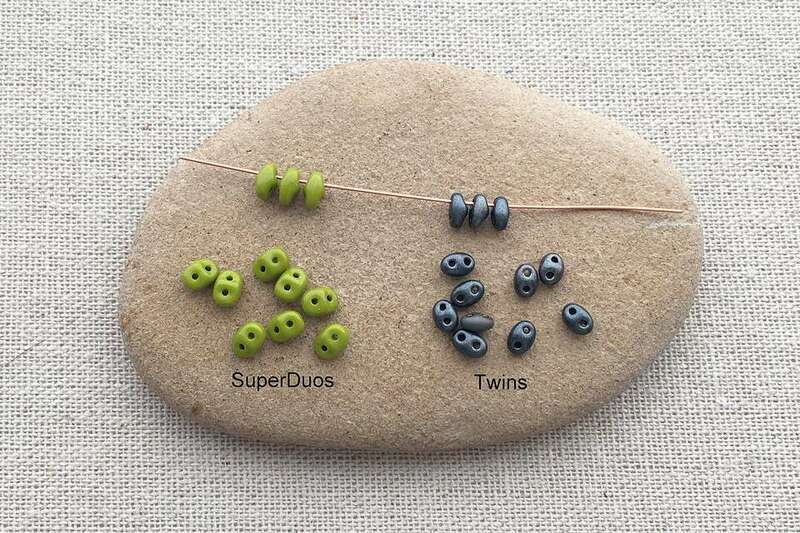 SuperDuo and Twin two hole beads can also be used for the same types of beading projects. They can be joined together using variations of traditional off-loom beadweaving stitches such as peyote, herringbone, right-angle weave or St. Petersburg stitch. 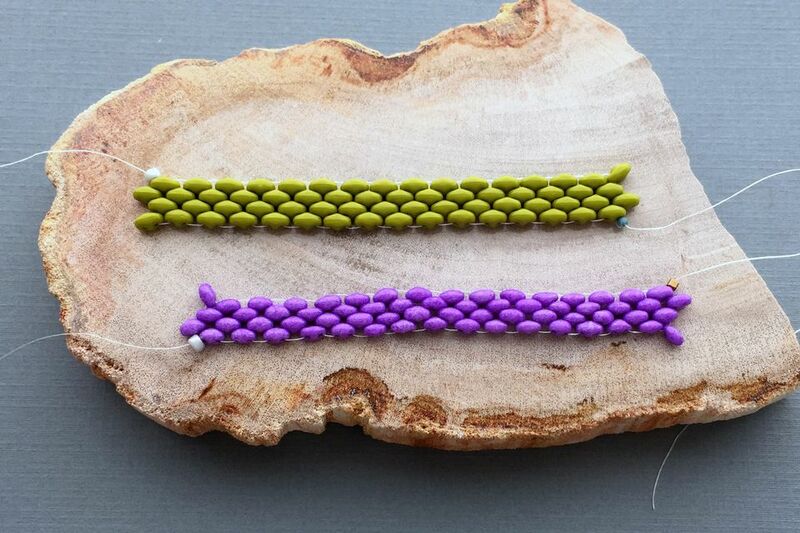 They can also be used alone or in combination with regular seed beads. SuperDuo and Twin beads can also be used to make shaped beadwork such as flowers or snowflakes or even in three-dimensional beadwork projects. All of these similarities aside, SuperDuo and Twin beads are different in several important ways. Shape: SuperDuo beads are more precisely manufactured and are more even in size and shape than Twin beads. This means much less culling or removing and throwing away, unusable beads when you are making a project. The shape of SuperDuos is also more tapered on the sides and slightly more angular in the center. This means they hug around size 11 beads placed as spacers between them and align a little better when making a circular flower or snowflake shapes than twins. Mass. SuperDuo beads are more substantial than Twin beads; In addition to being more evenly shaped, each bead contains more glass. SuperDuos also tend to be slightly larger than Twin beads, even though both are said to be 2.5 mm by 5 mm. Colors. SuperDuo beads are available in a larger variety of different colors and finishes than Twin beads. This is due to another difference in the manufacturing process. SuperDuo beads are made with colored glass and they may have one of several additional coatings or finishes added. Twin beads start with one of several base colors including crystal, white or black. Color finishes are applied to each of the base colors to create the available Twin bead colors. This results in a sizable, yet smaller palette for Twins when compared to SuperDuo beads. The finish of Twin beads can be removed by rubbing the surface with a nail file or similarly abrasive surface. It is unlikely to be worn away by normal wear, however. Price. As a general rule, the basic colors of SuperDuos tend to be more expensive than the basic colors of Twins. In some cases, prices per gram can be similar between the two lines, but there are fewer SuperDuo beads in a gram, about 15 per gram than there are Twin beads, which have about 20 per gram. Which bead you prefer is likely to depend on your style or project selection. If you prefer precise even beadwork, SuperDuos will meet your exacting standards. If freeform, organic beadwork is more your style, Twin beads will likely work in your beadwork projects.